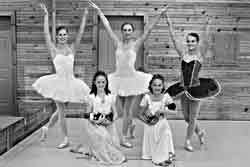 The Sun Valley Ballet School will perform “The Nutcracker” at the nexstage Theatre in Ketchum from Dec. 10-12. The holiday season brings about many traditions in the Wood River Valley including the annual performance of the Sun Valley Ballet School's "The Nutcracker." The timeless and classic ballet is not just a valley tradition. "Nowhere else in the world is this ballet so beloved as in the United States," said New York Times reporter Alastair Macaulay in an article called "The Sugarplum Diet" on Nov. 10. "The Nutcracker" was first performed in St. Petersburg in 1892. It tells the story of a young girl, Clara, and her magical journey. The role of Clara in the Sun Valley Ballet School production will be danced by 10-year-old Kennedy Watts and Lindsay Morton. "Lindsay and Kennedy have worked very hard and are performing the role with grace and skill far beyond their young years," said Sun Valley Ballet School Artistic Director Sherry Horton. The lead role of Sugar Plum will be performed by graduating senior Kelsey Brennan. The Sun Valley Ballet School's other two graduating seniors, Kathryn Caminiti and Tanner Dredge, will perform as the Snow Queen and Spanish Doll. < This year, the Sun Valley Ballet School is excited to welcome a new guest artist, Peter Kozak. Kozak will dance the role of Snow Cavilier and Sugar Plum Cavilier. Kozak is a "premier danseur" at the Columbia City Ballet in South Carolina. He danced for four years with The Joffrey Ballet of Chicago, and he was also seen onscreen with Joffrey colleagues in Robert Altman's feature film "The Company." Before joining The Joffrey Ballet of Chicago, Kozak was a principal dancer with the Cleveland Ballet, appearing during five years in works of Balanchine and dancing principal roles in "Swan Lake," "Giselle," "Coppelia" and "A Midsummer Night's Dream." A new element to this year's production of "The Nutcracker" will be the addition of live music under the direction of Alyssa and Brad Hershey. Horton said she is very excited about joining forces with two such talented artists and the new energy that the live music will bring to this holiday classic. What: Sun Valley Ballet School presents "The Nutcracker." Where: Performances will take place at the nexStage Theatre in Ketchum. When: Show dates are Friday, Dec. 10, at 7 p.m., Saturday, Dec. 11, at 2 p.m. and 7 p.m. and Sunday, Dec. 12, at 3 p.m.
Tickets: Regular reserved seating is $25, general admission for adults is $15 and for students is $10. Friday and Saturday evening performances offer special $50 gala seats, in which $25 is a tax-deductible donation to the Sun Valley Ballet School. Tickets are available at Chapter One Bookstore in Ketchum, Yellow Brick Road in Hailey and Hawley Graphics in Bellevue or call 806-1441.